We know that there’s never a second chance for a first impression – and always act accordingly. 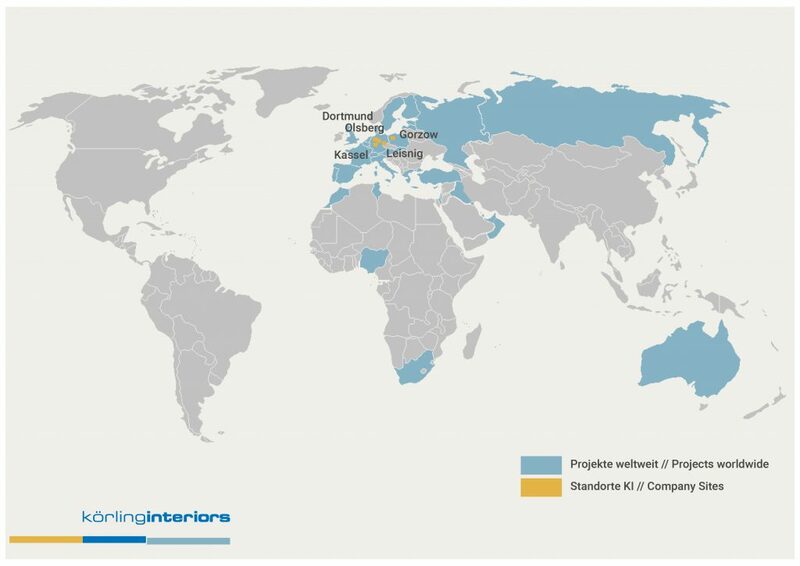 We are proud to be among the leading companies in the field of interior work, for we have left no stone unturned to reach this position. For 140 years, all our actions have been based on honesty, open-mindedness and reliability, and our service has been characterised by firmness. European Experts for Projects all over the World. In the Dortmund based company headquarters, as well as in four other offices and at three manufacturing sites in Europe, interior work in highest design and manufacturing quality is designed and produced by our staff. As part of the Körling group, we execute projects of any size in a timely manner, in reliable quality and under strict cost control. We co-operate with architects of high international repute and are well networked with specialists in all relevant disciplines. Transparency, fairness and confidence form the basis of a long-term close relationship to our partners.